Not many films can boast the near equivalent of Star Wars: The Force Awakens’ three-week ticket sales in its first weekend, but that’s exactly what Where Am I Going? achieved when it opened in Italy earlier this year. Indeed this hilarious comedy now stands as the highest-grossing film in Italian cinema history, earning over 60 million Euros. Join us for Limoncello di Capri cocktails before selected screenings. See Event pages for details. A phenomenon in the history of the Italian box office. 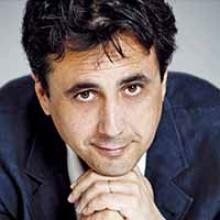 Born in 1963, Gennaro Nunziante is a writer and director known for the films Cado Dalle Nubi (2009), What a Beautiful Day (2011) and Sole a catinelle (2013). The success of Where Am I Going? (2016) has cemented his mantle as an Italian hit-maker.